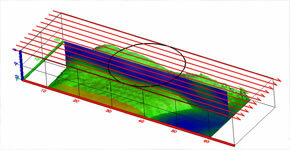 Vertical Electrical Soundings are among the first geophysical methods applied to the study of the subsurface. A cuadripole is used to inject electricity into the ground and to measure the generated voltage difference, thus obtaining the apparent resistivity. 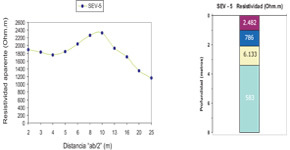 By increasing electrode spacing deeper electrical resistivity information is obtained. 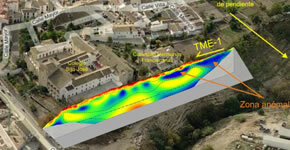 It is an effective and economical method to investigate several hundred meters in depth from the surface. It is very used in hydrogeological studies for groundwater location prior to drilling, and in shallower projects related to the design of earth rods in power plants, etc. It is one of the most common tools for the characterization of the subsoil, due mainly to the rapidity in data acquisition, to the null impact of the survey in the field and to the wide range in electrical properties that characterize typical ground materials. For these reasons it is an essential tool in geologic, geotechnical, mining and environmental investigation projects. Geofisica Consultores uses state-of-the-art equipment, able to connect up to 960 electrodes in a single array, making it possible to lay out long investigation profiles, reaching deeper into the ground. The three-dimensional nature of most buried structures can make its study insufficient from a bidimensional point of view. Parallel profiles close to each other (and even in different directions) can be combined in a single processing inversion to obtain a unique model of any given complex structure. There are a lot of applications (quarry reservoir determination, contamination plumes, karstic features…) that make it necessary to face the study from a three-dimensional point of view.